Welcome back everyone, Today is day #2 sneak peek of Taylored Expressions September Release. Today I am showcasing two new products again. The first one is a background stamp called Autumn Leaves. While you guys are going into fall, I am going into Spring because I live down under. But I love autumn season and the rich colours of fall. 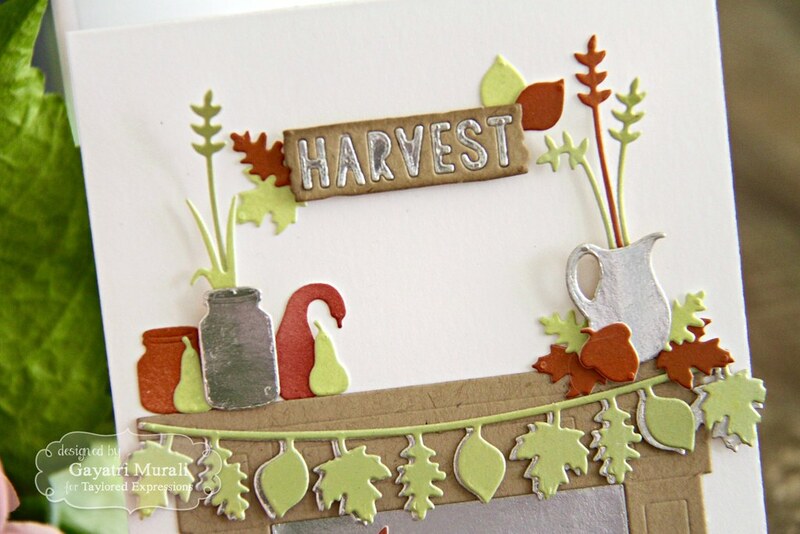 So here is my card using the Autumn Leaves background. I white heat embossed the background stamp on watercolour paper and loosely coloured the leaves using Zig clean colour brush pens. I also spattered the same colours on the entire panel. 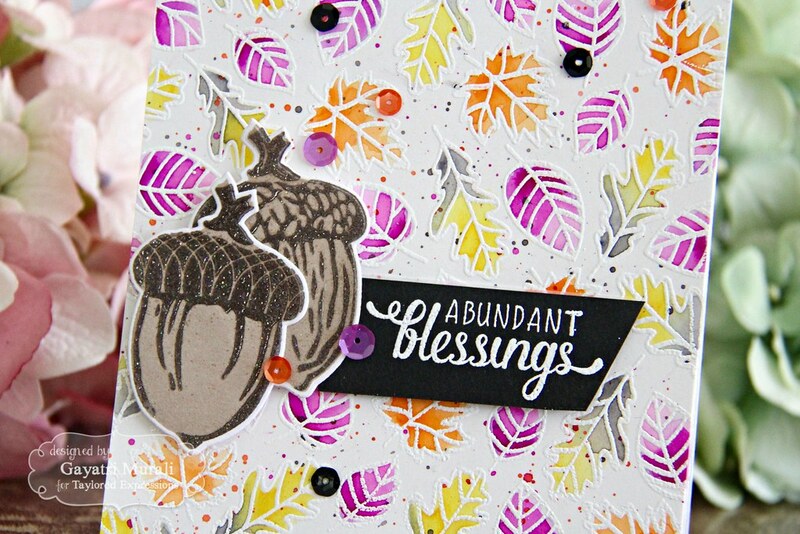 The Acorns are from Simply Stamped Acorns stamp set which is also a new release. This set is a layered stamping set. I stamped the acorns using Toffee dye ink and heat embossed the detailed layer using the new Mocha dye ink. Then die cut both the acorns using the coordinating dies. 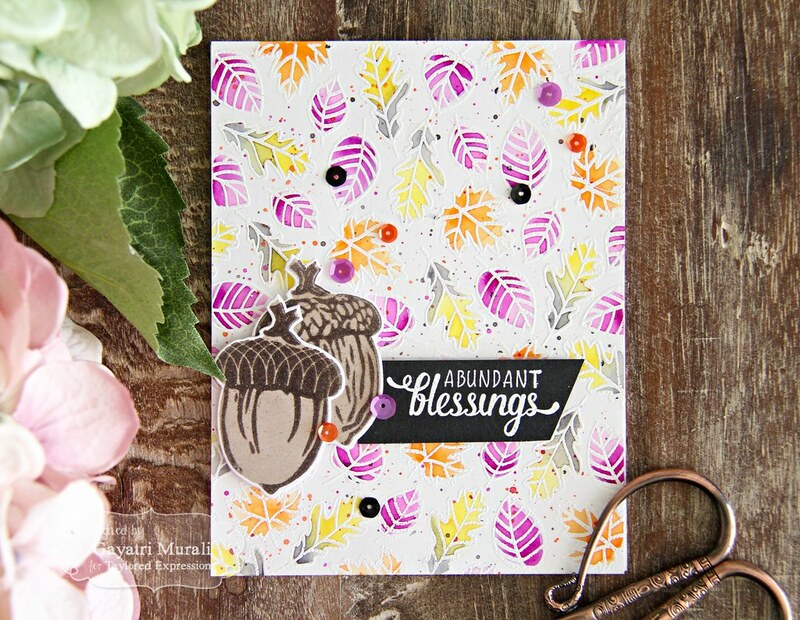 The sentiment is from Simply Stamped Acorns stamp set which I heat embossed on a strip of Oreo cardstock. I embellished using Build a Scene Halloween sequins collection sequins. My second project uses the new a new die set in the Sitting Pretty series called Sitting Pretty Fall Accessories. These are cute fall themed dies which are to be used to accessorise By the Fireside die. I love this series of Sitting Pretty. So much fun die cutting and creating a scene. I picked a colour theme before I created the scene. My combination has two neutrals – white and Kraft, two colours – muted green and burnt orange and one metallic – silver. For the green and burnt orange, I sponged two white panels with Nuvo Mousse in Spring Green and Fresh Copper. Once dry, I used these panels to die cut all my elements from Sitting Pretty Fall Accessories dies. I also threw in a few silver elements. 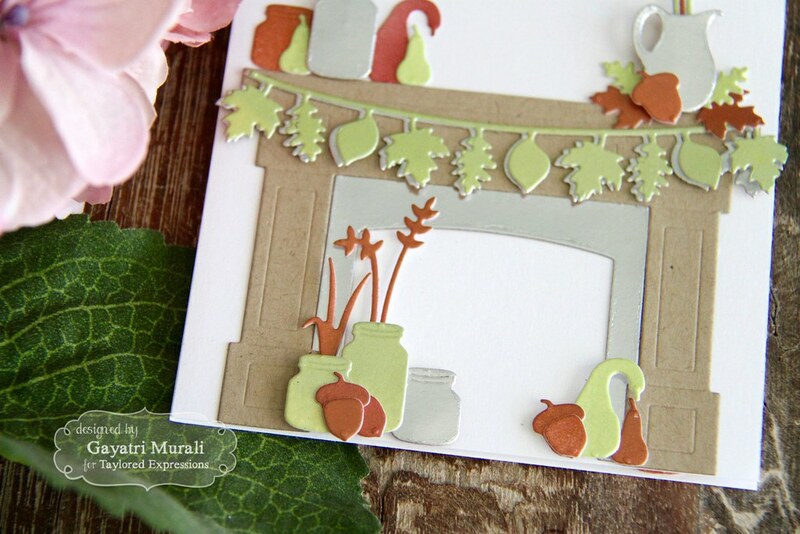 The fire place is from By the Fireside is die cut using Toffee and Silver cardstock. Then basically I created the scene by adhering the die cuts in layers. Some flush glued and others using foam adhesives. I had such a great time making this card. Here are some closeups. Thanks for stopping by my blog. I will see you tomorrow for day #3 sneak peeks. 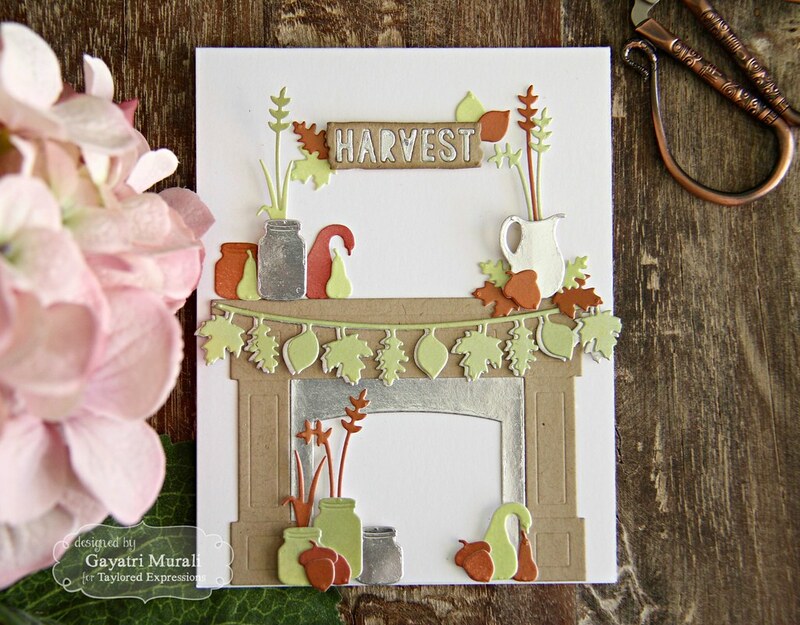 Beautiful designs and inspiration Gayatri! 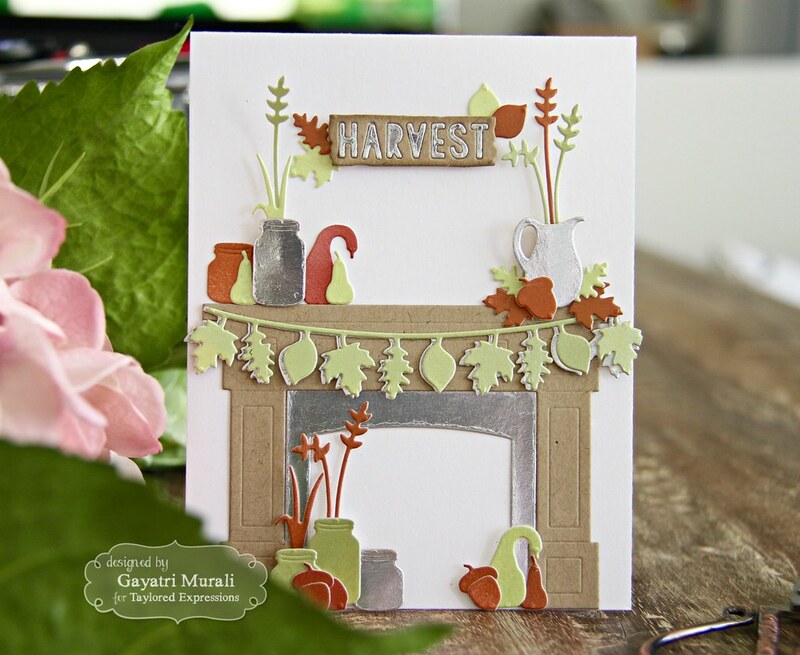 So very fabulous Gayatri, love the bright background of leaves!